Hello, folks! It’s that time again! In Rising Angels: Fates, Natalie is up against several opposing factions who have their own agenda in the story. Last time we talked about Alexi, who represented the Raltin Empire faction. Now, the evil bad guys are pretty easy to hate and work against. I mean, they’re evil, right? They eat babies and burn down puppy orphanages. Raltins are like that, you know? However, not all the people who are gunning to bring Natalie down are cut from that simple ideological cloth. Some of them are Katajions as well, just trying to protect their homes from a rampaging intelligence agent gone rogue. Bio: Anton works as Director Sora Doichu’s assistant, helping her save the universe, but mostly doing her day-to-day paperwork. Originally a political writer, Anton was injured in a car accident and frozen with cryogenics. After being thawed, he caught Sora’s eye for his quick thinking and ingenuity. 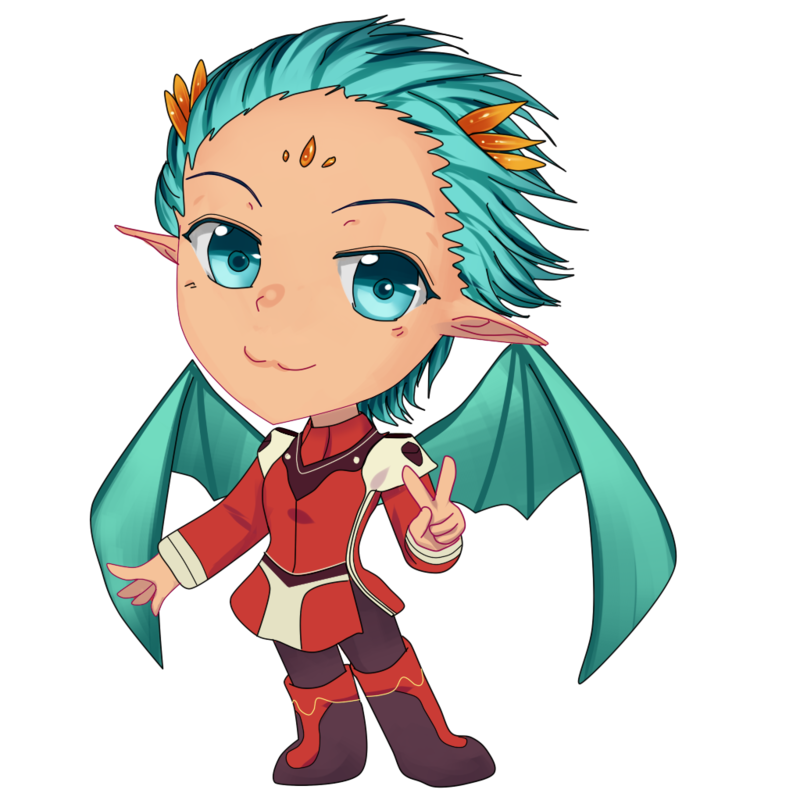 Sora tends to overwork him with cleaning up her messes, but Anton loves what he does and works hard to keep peace throughout the land. Even when it could put him in danger, Anton goes out of his way to protect as many people as possible. Chief’s Notes: Anton Rogers… You almost can’t talk about the overarching series without talking a bit about Anton Rogers. While he was not the original protagonist of the series, he has been at the forefront of it since pretty much the original start of the fictional story pieces. Now, it brings me a lot of shame to admit this, but Anton started out as a self-insert character. I was young and still developing as a writer. I thought that it was a cool idea and everyone would love it. Anton stayed this way for a while, but… I lost control of myself, in a manner of speaking. Over time, he started doing things that I did not approve of. He started saying things and doing things that I stood against, but I could see him doing. It’s interesting to watch how characters grow over time, just like people change and evolve as experience molds them. In the end, I had lost my self-insert and got a very peculiar protagonist. One of the things we are doing with Anton is changing up his look from our older visual novel, Anton’s Vacation, and going back to his canon look. Darker skin, greener eyes, and, most importantly, a uniform that isn’t from a Japanese high school! Now, Anton has always worn a gray uniform, so that was the one aspect from Anton’s Vacation that had to stay. Unlike Natalie and some of the other Special Investigations and Tactics officers, he blends into the background a lot better. When facing up against Anton, one of the first things the players are going to notice is that he’s friendly. It’s a bit of an awkward friendliness as he isn’t the most practiced speaker, but he obviously means well. Unlike Alexi, he doesn’t want to wear Natalie’s lower intestines as a necklace. He’ll buy you a cup of coffee and talk about all of the latest games that have come out. If you forget for a moment that he’s working for the group trying to arrest Natalie, he’ll get what he wants quickly and it will be game over. 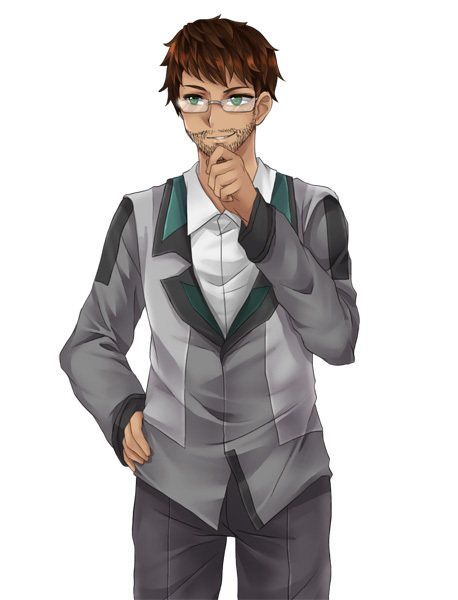 Though he is kind-hearted, Natalie (and you as the player) should always keep the veteran investigator at a distance. You never know what innocent sounding question is going to be for the match point. On the other side of the coin, Anton is working towards the same goal that Natalie is. He’s a loyal patriot to the government he helped found so many years ago. Even though Natalie turned against the Katajion Directorship to ensure that the artifact would never have a chance of falling into the wrong hands, that doesn’t mean she’s turned away from her oath. Hurting a fellow SITO would be a heavy burden on her, one she doesn’t quite know if she could carry. Fighting against Anton too hard could hinder both of them and allow the Raltins to take the prize. Besides, Sol and Anton have worked together in the past. They’re friends… right? Well, that’s all for this update. Those are the two major villains who are going to be your adversaries in Rising Angels: Fates. There are other ones, but you will be facing down those two most of the time. As we bring this update to a close, I want to thank everyone who has supported us! I know I do this every time, but my gratitude knows no limits. We’re 37% funded so far and I know that we will make it to 100%. Please help continue to spread the word out there! Every little bit helps to make this game a reality! This Sunday we are planning on showing a video of some of the upcoming gameplay, so please stay tuned! Chief out! Hey, folks! Chief here again with another update! I know many of you were looking forward to hearing more about Zuri and some of the crazy things behind her development, the crazy psycho…. I mean, charming imperial vicar beat her to the punch and gets to take today’s character update! Bio: Alexi grew up on a poor desert world with little wealth. In order to survive, Alexi turned to cutthroat thievery and preyed on those to traveled to her world. Unable to stop her rampage of crime, the imperial government offered her wealth and protection from the law if she would use her “talents” against their enemies. While she doesn’t care for much for her supervision, Alexi loves the chaos they wreak upon the universe. Chief’s notes: For those of you who have followed my work for a long time, you’ll know that I very rarely have a direct and visible antagonist. Normally my antagonists are always out there in the nether, doing their dastardly deeds until the protagonist cleans everything up and saves the day. Very rarely do the villains move in the open when our heroes can directly engage them. Normally they only get to take down a minion or minor villain. Stan would be the best example of this with his downfall. Alexi is the next step up the Raltin chain of command. 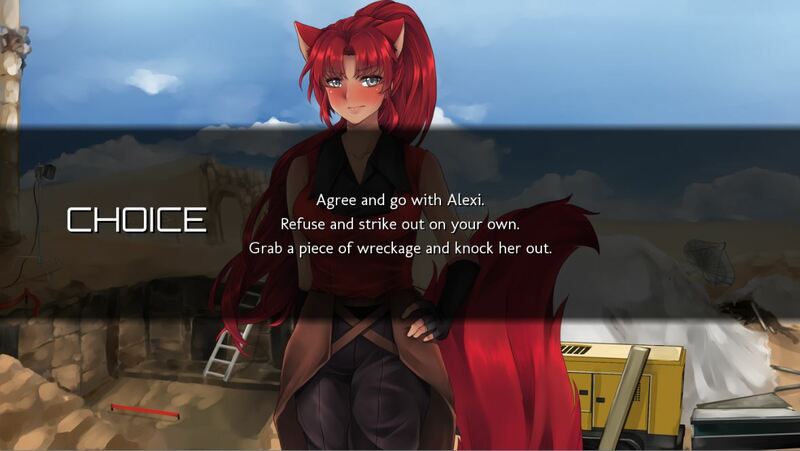 While their actions can be argued to also be for the betterment of the universe, Alexi’s actions can be easily defined as hindrances to Natalie. The opposite is true as well; Natalie’s efforts to prevent Stan from accomplishing his assigned goals means that Alexi’s plan was disrupted. What that plan is though remains to be seen… When we last left the Raltins in Reborn, they were nothing more than a hypothesis. We never see a Raltin ship, a Raltin agent, or anything other than speculation to their presence. Alexi is here to change that. When I was deciding who the Raltins would be fielding for their agent attempting to secure the artifact, I wanted to make a strong foil to Natalie. I needed someone who could think on their feet, move independently, and, if need be, be more than willing to get messy if the situation called for it. I didn’t want a bumbling fool like Stan or some evil monster of the night. It’s hard to take a threat seriously when they sound like Team Rocket. Alexi is the empire’s answer to SITO agents. Skilled in combat, armed with both technology and information, and prepared to give their lives to the glory of their emperor. When it comes to Natalie’s interactions with Alexi. Not only is she more than willing to simply kill Natalie and all of her team, but she has the means and ingenuity to pull it off. Killing people and tying lose ends is something that Alexi loves to do for coin and country. But there is one thing going for Natalie against this red-headed nightmare. While Alexi wants nothing more than to take revenge on Natalie for an action in their past, she’s also a diehard imperial and places her emperor’s wishes before her own. If Natalie can force Alexi to accept that their working together is the only way, perhaps they can look past the bad blood between Raltins and Katajions. Or at least stall a little bit before the knife ends up in Natalie’s back. Well, that’s all for today’s post. Of course, there are two more villains in the wings who are demanding their time to shine, so perhaps we might have a few more villain posts as the week goes on. As always, thank you again for your donations. We are adding a special tier for those of you who are interested in acquiring both daki, as well as two other tiers for those of you who want either the short story or art book separate of the codex. If you have any questions, please feel free to send them! Until next post, Chief out! Hey, folks! Chief Komi the Writer here with the latest and greatest of the updates! Before we get anywhere in this update, I want to take a moment to thank everyone who has donated so far. Your donations are critical towards making this game a reality. Words cannot convey the extent of my gratitude. We are currently over a quarter of the way there and I know we will be able to keep the movement strong and make it to that $4k mark! If you haven’t donated yet, please consider doing so! Okay, gushing aside. Let’s talk shop. Today I want to talk a bit about the first route in the yuri series, Zuri. Well, that’s what I was going to originally talk about before KS ate my update. So instead we are going to talk about factions in the game today and talk about Zuri tomorrow after I’ve calmed down a bit. In the universe of the Rising Angels series, there are three major superpowers. – Katajion Directorship: One of the three intergalactic superpowers that governs the central twenty four worlds of known space. Lead by a group of fifteen men and women of varying races and homeworlds in charge of different sectors of government, the Katajion Directorship has a wide-spread but weak central government. While each director has charge of their individual sector (Eg: Space Forces) to set rules and regulations, most power resides in the individual planets. Between a strong belief in rugged individualism and a long history of ineffectual directors, the Directorship is more of a confederation of planets than a true federal government. While there is no “good guy” government in the universe, all of the protagonists to date have come from the Katajion directorship. Most of the Katajions are relatively simple people trying to survive in a harsh universe. Since its inception, that KD has been fighting for its continued existence against warlords, foreign governments, and its own leadership. The idea that the best way to solve a problem isn’t to go through the formal chains of command but by striving independantly against it is commonplace in the ranks. Natalie is almost the perfect embodiment of Katajion ideals. Despite what leadership says, she heads out to protect her home against dangerous threats with a team of trusted individuals. Of course, this is also why the Directorship is very ineffectual and almost always on the defensive. One important thing to remember when working with Katajions in Rising Angels: Fates is that even though they may be allied with you, allegiance is often a fickle thing. Notable Katajions in Rising Angels: Fates: Natalie Puccile, Sol Hackett, and Sora Doichu. –Ryu’llian Republic: One of the three intergalactic superpowers that governs the thirty northern worlds of known space. Lead by a congress of three hundred representatives (five from each world) and a president, the Ryu’llian Republic is one of the few true democratically elected governments remaining. While they advocate peace between the Katajions and the Raltins, they understand the danger posed by the war-mongering Raltin Empire and provide the Katajion Directorship with both financial and military support in the on-going conflict. However, with the most recent election of congress, support for the war seems to be dwindling as Ryu’llians become more and more worried about the state of their own affairs. The Ryu’llians are an interesting bunch in the universe. Unlike the Katajions and the Raltins who are prepared to fight each other to the death over territorial claims, the Ryu’llians prefer diplomacy and negotiation to direct warfare. The constant bloodshed of the universe isn’t their concern. The plights of others is not their concern. What matters most to most Ryu’llians is maintaining their philosophical ideals of sentient rights and ensuring that even the smallest of voices can be heard on the political stage. With the exception of a few planets, most of the republic wants to keep as far away from the southern conflict as possible. During the course of the investigation, Natalie will have a harder time getting information out of those who hail from the republic. As speech is an art form, most Ryu’llians also will be wary of Katajion investigators and their truthfulness should often be questioned. Are they trying to help Natalie keep the war away from their borders or are they simply trying to get rid of her? -Raltin Empire: One of the three intergalactic superpowers that governs the forty six southern worlds of known space. Unlike their more free and independent northern neighbors, the Empire is ruled by a strong central government lead by the descendents of their founder, Emperor Colin Howe. With a history of traditional beliefs in discipline and etiquette, most imperials find it their sworn duty to defeat the enemies of their heritage, the Katajion Directorship. After nearly a century of conflict and strife, the Empire seems to be losing its war-mongering drive and is settling on developing their homeworlds. Natalie’s natural enemies and active foes lay in the Raltin Empire. Unlike the incredibly liberal Katajion Directorship, the Raltin Empire does not lay stock with individual freedoms. However, unlike a Katajion, you instantly know who a Raltin is loyal to without question. They are loyal to their homes, they are loyal to their state, and they are, without fail, loyal to their emperor. The emperor’s word is unquestionable, as is his wisdom. The idea that the imperial state could possibly be wrong is molded out of its populaces heads at an early age. There is only one way that a Raltin would ever consider helping out a Katajion, if it directly helps to bring further glory to the empire. Where a Katajion or Ryu’llian might consider Natalie’s requests for help, if it isn’t approved by the state a Raltin won’t even consider it. While this makes them for useless allies to the rogue Natalie, it does make them a lot easier to predict and plan for. As long as Natalie can keep ahead of the hive mind, she can keep ahead of any possible Raltin tricks. Okay, going to call it here for today’s update. There are some non-state players to join the ranks, but those are for another day. The update schedule got upset by my minor illness over the weekend, so we are gonna be pushing updates a little more frequently this week. 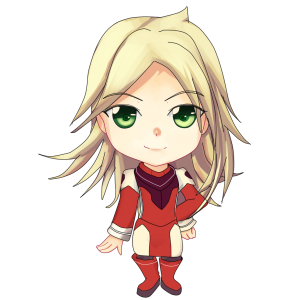 Right now, our upcoming updates will include both Zuri and either Sol or Kika, a special video showing a story section (with Kika), and an investigation section to help show you some of the ideas we want to implement into Rising Angels: Fates! Stay tuned for tomorrow’s Zuri update (with some art)! Chief out! The kickstarter to fund the sequel, Rising Angels: Fates, is now launched! If you want to help out IDHAS Studios and bag some niffy rewards, now is the time! Possessing the crystal that almost killed the lives of the brave crew of the KSS Nimross, Special Investigations and Tactics officer Natalie Puccile is on the run from those she once served alongside. With nothing but the scraps of information from her previous investigation, Natalie is forced to scour the galaxy for hints of the truth and support from those who trust in her. But with threats from all sides closing in, will her skills as an investigator and the faith of those loyal few be enough to prevent the truth and safety of the galaxy from disappearing into nothingness? That’s right! It’s Rising Angels: Fates. Not Rising Angels: Fayes, like I keep misspelling. I was pondering how I should make the first public announcement. In the end, I decided to go with some of the biggest questions that have hovered over development and discuss them first. We’ll go more into the cast and plot in our next Fates post. One of the biggest things I heard from the audience is that everyone wanted to have more impact on the story. More choices, more story impact. The good news is that this time around we will have considerably more interactivity for you folks who want to cause some chaos. It will consist of two separate types sections, the investigative sections and the story sections. In story sections, it will play out like a traditional visual novel. While a lot less interactive than the investigative sections, there will still be choices in the story sections. These choices will more likely be about Natalie’s relationships with the crew and their day-to-day lives during the investigation. These choices will have an indirect impact upon the story, however. Your relationships with the crew can turn friends into enemies or make the insidious threats less likely to sabotage your endeavors. When you are a government special investigator, the right person can make or break your quest. In investigation mode, you get a lot more hands-on into the mysteries surrounding the crystals and the players seeking them. Investigation mode will allow you to interact with your surroundings, finding clues and unearthing new evidence that may lift the shroud around the events that are transpiring. With these clues, you will be able to gain light from those around you or push the right piece of evidence to force those who would work for evil back into the shadows. However, tipping your hand at the wrong point or pressing your allies too hard could easily undo everything you seek to accomplish. A good investigator will have to know when to let the little fish get away to snag the big one. Since we are on the topic of things that everyone wanted added, let’s talk about some romance. There was a large breadth of responses to this. Some of you were happy with just having the growing love with Zuri. Others wanted some time with Sol and Alphonse, while some wanted to just have some friendship. I will take a moment and confirm what is set in stone. Zuri: I know I’ve said this several times, but I will say it again. The Rising Angels series is primarily a yuri series. Zuri is still a confirmed love interest and arguably the main female lead behind Natalie. Zuri’s story is going to be a continuation to what went on in Reborn and develop as their adventure goes on. Will it last though when a figure from the past returns to Zuri’s life? Kika: The problem with writing a Kika romance route is that Kika really isn’t interested in having a romantic relationship. Where as Zuri wants someone to give her heart to, Kika just wants a friend she can trust. That being said, her route is going to be a lot more focused on their bonding as close friends through the rigors of war. That, and seeing what Kika is hiding behind her attitude of supremacy. New characters: Right now, there is at least one more romantic lead coming out of the woodworks. The new character isn’t really a new character to the series, but she’s been sitting in the wings since her last appearance. She’s a lot more experienced in matters of the heart than the crew, so don’t expect a simple video game or toot on the flute to win her over. There may be others, but I’m not making anything official yet. I do want to make sure there is a calm, sweet girl to accent some of the more dynamic ones of the group. A certain white-haired lupide might fill that roll well. Otome/Sol: Otome is probably going to depend on how the kickstarter does. Remember earlier in this when I said that RA was a yuri series? I meant it. Shoujo-ai is the primary focus. For once, I’d like to assure the yuri audience that they are going to be the main cater, not the tack-on at the last minute. That being said, I am still planning on writing a Sol route because I’m curious how it would go. Funding… Funding is a major issue right now. Unlike previous games where I fronted everything at personal expense, I don’t have the same amount of operating capital this time around. Everyone knows how much I dislike Kickstarter, but it currently seems like the best way to raise the needed money. I hate to say it, but if things go bad with the kickstarter, we are gonna have to give this some serious cuts. It may be the premature death of the series, I don’t know yet. We’ll be counting a lot on the support of fans this time around. Will it be commercial? That’s a tricky question. Right now, yes, it will be commercial. However, despite the numerous arguments I’ve gotten in with my assistants, I am going to make sure there is a free version. It might only be Zuri’s route or less interactive content, but I refuse to let those who can’t afford it be unable to continue the series. It’s just cold and cruel to let you play RA: Reborn, get attached to the story, and then cut off the rest of the series. Release date: I have not set a hard release date. The tentative release date is going to be October 30, 2015. Depending on how things go, I might be able to bump that date up. I want this out so I can play it just as much as you all want it. What happens if the kickstarter fails? Well, there won’t be any funds. No backgrounds, no CG, no new sprites, no nothing. Everything will be dead in the water. If the kickstarter fails, the novel will still continue on, but that’s about it. No playing investigator, no amount of gameplay or options, and no choices of romance. It will just be a text story. Sound effects? Yes, we screwed up with sound effects last time. This time, we are ahead of the power curve and will be including sound effects to help promote immersion. Will there be voice acting? No. There will be no voice acting. I’m not budging on this one. Reborn was supposed to have voice acting, and some of the voice actors did deliver. They worked hard and I wasn’t able to make that dream happen because of complications with other VA. This has happened every time we want to do voices. No. I’m not going to waste anyone’s hard work again. What platforms will it be on? The traditional Ren’py four; PC, Linux, Mac, and Android. The android version will be customized this time to be easier on the android people instead of being a direct port. The soundtrack was very, very well received. The great news is that we are going to be expanding the soundtrack as well as well as including a music box so you can listen to your favorites outside the story. The codex was very sparse in the original release. Not only are we doing a massive addition to the codex, but one of the kickstarter rewards will be a copy of the ultimate codex. This codex will not only go into great detail about the various elements that Natalie interacts with in her journey, but will talk about the decade of lore that has been generated. You’ll get more KDF background than you cared to read. Setting? Unlike last time, where we were stuck cruising around in the Nimross, we will be spending some more time on the ground for Fates. The background list doubled from our deep space adventure, so expect to see some more sights of the universe. Our video of the post is one that’s been bugging me. I’m particularly fond of it while I write Nat and Zuri scenes.